Katharine Hepburn was as much a personality as she was an actress, and The Philadelphia Story is the quintessential depiction of both. Here is where Kate's public persona—haughty, patrician, and fiercely independent—came to be defined. But it's also one of the best showcases of her considerable acting talent, alongside great performances by fellow legends Cary Grant and Jimmy Stewart. What else is there to know about this sophisticated comedy classic? Let's eavesdrop and find out. 1. IT WAS LOOSELY BASED ON A REAL PERSON. The character of Tracy Lord was inspired by Helen Hope Montgomery Scott (1904-1995), a beautiful socialite whose family had been Philly royalty for generations. (Vanity Fair called her "the unofficial queen of Philadelphia's WASP oligarchy.") Her husband, railroad heir Edgar Scott, had been friends with playwright Philip Barry since their days at Harvard, and the Scotts and Barrys often socialized. Barry used some of Helen's exploits during the 1920s and '30s as inspiration for Tracy Lord's free-spirited ways. Mrs. Scott had no problem with the play, saying, "I thought it was great fun, but I really didn't pay much attention. I don't really think Tracy Lord was like me, except that she was very energetic and motivated." 2. IT WAS WRITTEN FOR KATHARINE HEPBURN. Philip Barry had been a friend of Hepburn's since she (and Cary Grant) starred in the movie version of his play, Holiday (1938). When Barry became aware of Hepburn's desire to recalibrate her career (see next item), he began tailoring the Tracy Lord character to suit her. The finished version created a persona for Hepburn that audiences would adore for the rest of her life: independent, sharp-tongued, icy, but ultimately vulnerable. 4. IT WAS A HIT ON BROADWAY FIRST, ALSO STARRING HEPBURN. The not-yet-completely-insane tycoon was Hepburn's friend (and former lover), and he ponied up some of the money for the stage production as well as the movie rights. He doesn't get all the credit, though: Hepburn pitched in plenty of her own money (box office poison or not, she was loaded), as did the Theatre Guild and Barry, the playwright. 6. CLARK GABLE AND SPENCER TRACY WERE HEPBURN’S FIRST CHOICE OF CO-STARS. It would have been her first film with Tracy, an actor she admired, but he was unavailable. Instead, their first (of nine) movies would be Woman of the Year (1942), followed by a love affair that would last the rest of his life. As for Gable, he may have had a scheduling conflict, but there was probably another reason he didn't play C.K. Dexter Haven in The Philadelphia Story: the film's director, George Cukor, had been fired from Gable's Gone with the Wind, and the two did not get along. 7. CARY GRANT HAD TWO SURPRISING DEMANDS. One, he wanted top billing, even though Hepburn's character was the protagonist and Stewart's character had more dialogue. Two, he wanted a salary of $137,500, to be paid directly to the British war relief effort. 8. THE SCREENWRITER WAS GIVEN VERY SPECIFIC INSTRUCTIONS. Donald Ogden Stewart (no relation to Jimmy), a successful Broadway playwright who'd come to Hollywood in the late 1920s, had actually adapted a Philip Barry play into a Katharine Hepburn movie once before: Holiday, in 1938. But his job of turning The Philadelphia Story into a screenplay was made more difficult by a peculiar demand from MGM producer Joseph L. Mankiewicz. He gave Stewart an audio recording of a live performance of the play so he could hear the audience response, and told him to make sure the same laughs all made it into the movie. Stewart felt "restricted" by this, to say the least, but he managed to mostly comply. When he accepted the Oscar for Best Adapted Screenplay, Stewart said, "I have no one to thank but myself!" 9. IT RESULTED IN JIMMY STEWART'S ONLY COMPETITIVE OSCAR. The beloved actor had been nominated for Best Actor the year before, for Mr. Smith Goes to Washington, and would be nominated another three times after this. But The Philadelphia Story was his only lifetime win, surprising those (including himself) who thought Henry Fonda deserved it for The Grapes of Wrath. (Some observers felt it was Stewart's compensation for not getting the Mr. Smith win.) In 1995, Stewart won an Honorary Oscar. 10. STEWART GOT SHAFTED, SALARY-WISE. As mentioned, Cary Grant got $137,500. Hepburn got $75,000 for acting, plus $175,000 to sell the play's movie rights (which Howard Hughes had helped her buy before the play even opened), plus a percentage of the box office. And poor old Jimmy Stewart? He got $3000 a week, which amounted to $15,000. 11. THE FINISHED VERSION INCLUDES SOME AD-LIBBING FROM STEWART AND CARY GRANT. When a drunken Macaulay Connor shows up at C.K. Dexter Haven's place to chat, Stewart decided to play it loose and improvise a hiccup before beginning to speak. Grant, caught off-guard, smiled slightly and quipped, "Excuse me," probably assuming Cukor would call "Cut!" and they'd redo it. But Cukor liked the natural, playful interaction between the two and kept it in. 12. IT BROKE SOME BOX OFFICE RECORDS. In 1940, Radio City Music Hall was "the nation's No. 1 movie house" (according to TIME magazine), the world's largest (6000 seats), and a useful yardstick for determining how successful a movie might be. When The Philadelphia Story opened there the day after Christmas 1940, it quickly drew the longest lines in the theater's eight-year history, selling a record 110,168 tickets in the first four days. It went on to play there for six weeks, beating a record set by Snow White and the Seven Dwarfs. 13. YES, THE "BOX OFFICE POISON" LABEL WAS REMOVED. 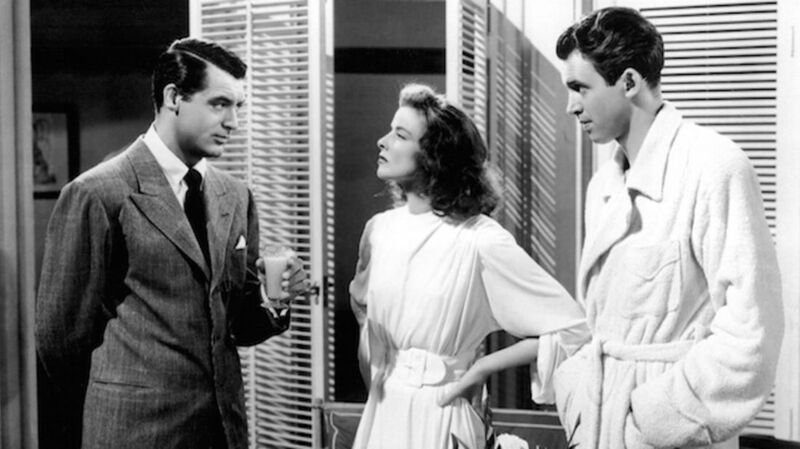 Hepburn made The Philadelphia Story as a way of getting off that "box office poison" list, and it worked. Harry Brandt, the Manhattan theater owner who'd said it on behalf of his industry, wrote shortly after the film was released: "Come on back, Katie, all is forgiven." 14. THE MAIN CAST REPRISED THEIR ROLES FOR A RADIO PERFORMANCE. The film was adapted into a 60-minute radio play in 1942, and a 30-minute one in 1947. Hepburn, Grant, and Stewart all came back for both versions. Hey, when you find a role you love, it's hard to let go.